PATENT FLOUR comes from the heart of the endosperm and is the purest, highest-quality wheat flour available. Depending on how much straight flour (100% of the kernel with bran and germ removed) it contains, a bread flour is either short patent (70-80% extraction), medium patent (80-90%), or long patent (90-95%). In general, the higher a flour's proportion of straight flour, the darker its color and the higher its protein content. First clear flour, which can contain as much as 18% protein, is technically not a patent flour, but the remnant of straight flour after the patent flours have been removed. You'll find first clear flour listed under "High-Gluten Flour." 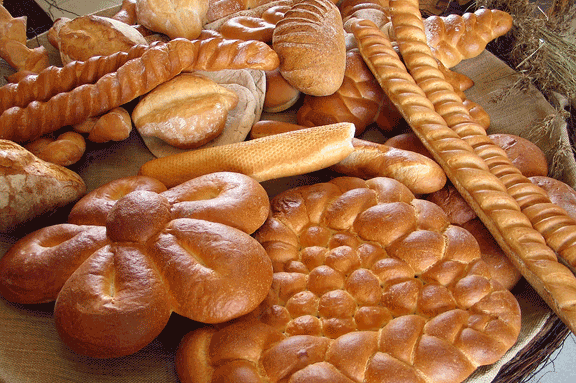 Cake flour and pastry flour, which are milled from soft wheat, have even lower extraction rates. Extra short patent flour, aksi called fancy, patent flour, (40-60%) is used primarily for cakes, while first patent flour (60-70%) commonly used in pastries and muffins.